Interested in entrepreneurship & creativity? Get your free ticket to Startup Live! today. Join us at Studio in Malmö for the startup event of the year. 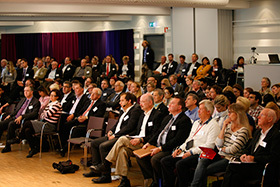 The free event will include some of the biggest startup names from south of Sweden. Panel Discussion with the Board of Malmö Startups (Min Doktor, Drivhuset, Nordic Ecommerce Summit, Investor,Fast Track Malmö, Mindpark)Startup Stories by Prisjakt, Fieldly and TendoFireside Chat with Chairman of the Board at Crunchfish19:30-20:00, Post-show mingle and drinksThe #startuplive & #malmostartups hashtags will be used during the evening, so go ahead and tag, talk and share ! Aktiviteten arrangeras av Malmö Startup.